Google Chrome is one of the best and well-known browsers in the internet world. The most attractive thing about google chrome is its simplicity. The simple and easy to use interface make it stand out on the top.Google Chrome has its own extension’s store, which has huge numbers of useful extensions. Opera, Vivaldi and all chromium-based browsers are compatible with these extensions also. 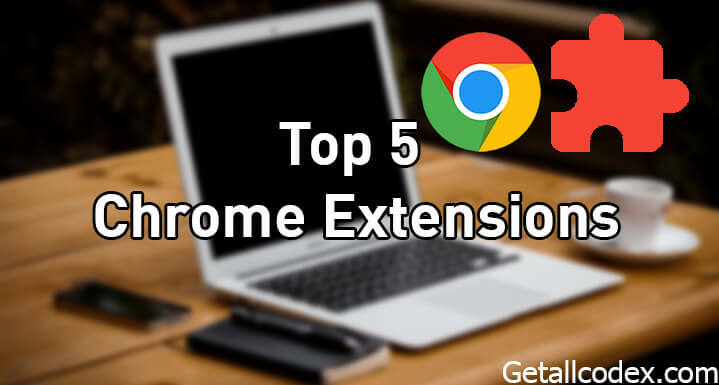 Today, we are going to share top 5 useful chrome extensions in 2017. This list contains very useful and must to have extensions, which are not only useful but productive and money savers as well. So let’s start from number one. Note: To use these extensions with Opera and Vivaldi first install the following extension given below in the link. Let's go over some of the key settings in general setting the default is to automatically suspend tabs, after one hour. If you're running an older computer or have low system specs, I would suggest reducing this time. If Chrome is your primary browser and you'd like to have several tabs open at one time, then the great suspenders a must-have extension. If you go to Wikipedia frequently, this is another great extension that is useful for giving you an improved reading experience on Wikipedia. Wiki and is an award winning interface, that cleans up the layout for improved readability and give a page fresher cleaner look. There are several settings which include, switching from a rich to a minimal look, you can change the font, switch to a dark mode, increase or decrease the text size and you can increase or decrease the page size. What is great about this extension is that it is lightweight and once you install it, you can forget about it. The wiki one interface will automatically appear every time you visit a Wikipedia page. This is one of the best chrome extensions for shopping online, you can check for sales while on a retailer's site and during checkout if there are any coupons, honey will automatically apply coupon codes to your shopping cart. It's really easy to use, when you first land on the shopping site, you can click the honey icon to find deals on that site. After you've done your shopping and you're ready to check out during check out honey will sometimes pop up with coupon codes that can be used for your order. It's a good extension to have on hand, in case it does honey only supports shopping sites in the US, Canada, Australia, United Kingdom, and India as well as sites that serve global customers. Grammarly as the name suggests works to improve your grammar, on nearly every place on the web that you can type. Including Facebook, Twitter, Gmail, and others. There's a demonstration document on the Grammarly website which gives some good examples. It's not just a spell checker and makes sure that you're using words in the proper context and checks for other grammatical errors. All errors will be underlined in red, fixing the errors is simple just hover your mouse over one of them and in green, it'll show you the corrections and then just click the corrected text to fix the error. At this time Grammarly only supports the English language Grammarly is free and does have a premium version with more features. If you're looking to get the websites, you visit frequently a brand new look stylish maybe disc for you. This is an open-source extension that can apply user created style sheets to a website to customize and personalize the appearance of the page. Any web site that has supported stylish themes, the icon will be colorized otherwise it will be grayed out. So select the icon and you can scroll through the themes for any site if you don't like any of these themes, you can select find more styles for this site which will open a new tab with more to choose from, you can install from here after selecting view details and then install style. If it was a useful list for you let me know in the comments, if you have a favorite Chrome extension that you feel should be mentioned in a future post and if you haven't done so already be sure to click the subscribe button to get future posts directly in your inbox for free. There are many Chrome Extension respect to Digital Marketing. Can you share more apart from above 5. Thank you.